A global increase in demand for its ability to produce precious metal contacts and contact materials encouraged Samuel Taylor Limited (STL) to recently invest £160,000 on two new AgieCharmilles EDM machines and an additional £30,000 on LogoPress software & training that seamlessly integrates with the Company’s existing SolidWorks 3D platform. “We worked on the two Diamond Jubilee bank holidays“, said Alastair Gordon, Samuel Taylor’s Managing Director. He explained that over 80% of its production is exported and as most of Samuel Taylor’s customers are abroad they don’t stop just because the UK is on holiday. To meet those demands Samuel Taylor has invested heavily in new equipment which enables it to design and make high quality progression tooling considerably faster than before. It claims that few companies in the UK have the genuine in-house design and manufacturing capabilities which Samuel Taylor has recently invested in. The GF AgieCharmilles machines, a new CUT 2000 wire EDM and a new DRILL 20, represent the very latest in advanced EDM technology. The CUT 2000 has a small footprint essential for STL and has been designed for micro-machining and super-precision applications, and is equipped with a whole host of integrated class-leading features. These include its rigid machine base and sophisticated and precise measuring systems (glass scales) for lifelong and repeatable accuracy. The choice of Agie again follows from STL’s older generation Challenge machines which are the backbone of the STL toolmaking facility. “Good service over the years makes the choice easier” said Mr Gordon. The new CUT 2000 has a universal single wire guidance system allowing the use of all wire diameters, from 0.30mm down to 0.05mm – which extends the flexibility and productivity of the machine. The machine is also equipped with GF AgieCharmilles’ 3rd generation Automatic Wire Changer again essential for STL which has run lights out operations for many years. The machine features the IPG (digital) Generator which, by carefully monitoring, controlling and adjusting the energy of each spark, delivers excellent and homogenous surface finishes. The incorporation of a Smoothsurf module produces a mirror finish and eliminates secondary polishing operations. STL is running a big R&D project with the machine using carbide and “the results of the finish even surprise us” said Mr Gordon. This new machine uses the powerful and flexible CNC Vision 5 control system. Supplied with a number of SMART modules, the control eases and speeds-up job set-ups and ensures a reliable and trouble-free machining process. The Drill 20 is the latest generation of small, highly-productive EDM Drills from GF AgieCharmilles, and the first fast hole burner that STL has acquired. The hole drill machine is designed for drilling parts in a range of materials (i.e. hard materials such as hardened steel or carbide). Its drilling capability ranges from 0.3 to 3.0 mm diameter through a depth of 200 mm. Particularly simple and easy to use, the integrated 3 axes (X, Y, Z) numerical control makes it possible to program a series of holes for fully automatic machining. This will result in the ability to carry pre-hardened stock blocks to help cut the lead times of tooling. Both machines are DNC-linked for ease, reliability and speed of data transfer and, together with the SolidWorks & LogoPress software, the company can considerably improve and speed up the process of designing and producing progression tools. “We have slashed the time required to make progression tools by half”, said Mr Gordon. Part of reason that Samuel Taylor can reduce lead times with the new machinery and software is because it is now making greater use of virtual manufacturing. The ability to create virtual progression tooling and simulate how it will perform means it can reduce waste and save time. 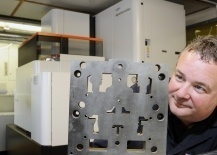 “We can simulate all the required parameters for the tooling before cutting metal thus ensuring a right first time approach to tool design” said Mr Gordon. Additionally Samuel Taylor has hired another highly skilled tool maker, to ensure that the machines and the software meet expectations and to help with the mentoring of the STL apprentices. Many companies in the world make metal components but Mr Gordon said that very few have the skills and knowledge developed by Samuel Taylor to make the extremely sophisticated tooling required in order to remain competitive on a world-wide basis.